Normally I struggle to sleep after an Ironman, waking in the early hours and writing a race report instead. Spectating was tiring, but lacked the long term soreness of race participation. I slept heavily last night; my spectator’s report waiting till this afternoon. Comparing my external perspective with athlete’s stories is interesting, what we experience when we race can appear very different to the outside world. I seemed to catch race day nerves and didn’t sleep so well on race night. On the beach, half hour before the start, they were still there; I could feel the tension in the air. As athletes shuffled into place behind the start line the adrenaline was flowing, everyone knew what was about to come. I was relieved not to be involved, it was only during the marathon I felt disappointment at not racing. The start creates the most vivid memories of the day, but it is over so quickly. In a matter of seconds the field spreads. 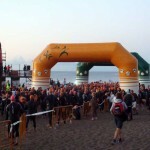 My swim start video footage shows that the first twenty rows are where the majority of rough contact happens. As athletes filter through the pace drops and slower swimmers take their time to find clear water. If you want to go fast you need to be up in those front rows and prepared to take a battering. Saturday’s swim was fast – conditions were good. Training during race week we’d noticed the favourable current helping us to the swim exit; combined with a good draft on the outward leg you could make good time. Not everyone took advantage. Ninety minutes in I spotted a pair of swimmers just starting their second lap, they barely made forward progress. A tough call to enter a race knowing you would be swimming for that long. They missed the cut off and their race was over in a couple of hours. I’d moved up to the bike exit by then; a slight uphill, single lane out of transition which created close moments as age groupers struggled to put feet in shoes. I’m amazed we didn’t witness any crashes in that initial kilometre. Athletes were all over the road – overtaking on either side, head down focussing on their kit or in the aerobars already hammering. The first few kilometres are easy, there is plenty of time to prepare yourself and then build to race pace, but most rush out at an intensity they can’t sustain for the day. The pros are fast and efficient through transition, they quickly settle on the bike keeping everything controlled. Age groupers are another matter. One led the swim, but a slower transition lost him places before he’d taken a pedal stroke. The bike to run transition provided further examples. Age groupers passed through T2 slowly and ran with notably less efficiency on exit. Signs of too much effort on the bike or insufficient run training and economy perhaps? The differences were distinct enough to identify who was racing pro and who was an amateur. With a long afternoon ahead of me I relaxed at the hotel rather than spectating on the bike course. Reports filtered in from the race, twitter and text messages often replacing a sporadic Athlete Tracker. It was hard to precisely follow anyone whilst they were away from Puerto del Carmen. We timed our return to catch the first athletes into T2. A remarkable number of 35 to 39 year old men were amongst the top bikers. Impressive riding, but as mentioned you could easily spot them on the run. The marathon is a long afternoon for spectators as well as the athletes. Less strain for us and we had ice cream breaks, but Steven and I were on the course until the last of our respective athletes finished. As the flow of runners increased I was nervous waited for my pair. Julie arrived on schedule, but Greg worried me by taking his time on the bike. Waiting for your team to come through was a new perspective on the race. It was a relief once I finally knew how they were going, whether they were on plan or not they looked comfortable. Seven hours were spent cheering on athletes and encouraging those we knew. I was pleased to see how well Julie ran – this had been a focus and she looked great; she almost appeared too comfortable, I felt like telling her to put more effort in! Importantly she picked up the pace and finished with faster laps than she started. I caught her at the finish line and was pleased that she’d hit her four hour run goal and set a Lanza PB under tougher conditions. Greg’s bike had not gone to plan and though he appeared happy he was clearly tired. I saw him walking on the last lap and had to resist temptation to run over and find out what he was playing at – I never authorised that! He toughed it out and finished shortly after Julie, completing his first Ironman. Not to plan, but issues holding down food early on the bike clearly set him back. The first two hours he wasn’t eating, a huge deficit to deal with during an Ironman. We’ll learn and address this at future events. Watching the race has given me a lot to consider as a coach and athlete. There are clear areas worth address. 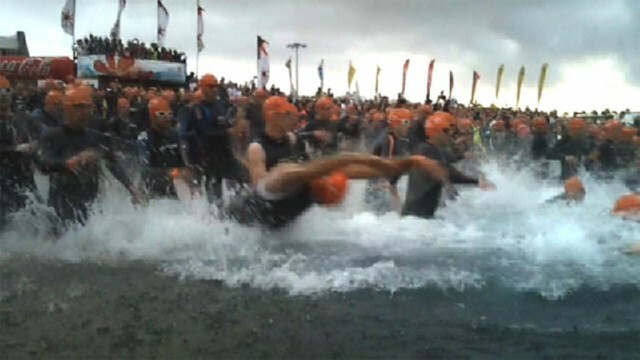 Any athlete looking to be at the front of a race needs to place themselves aggressively in the swim start. From there a well practiced and efficient transition is essential, there’s no waiting among the pros and no reason to for age groupers. Pacing on the bike remains critical, especially when course or conditions make it easy to go wrong. Get it right and if you’re run fit you want to leave T2 with a good leg turnover you can carry through the race (Julie got this spot on). There are details and refinements I can bring to my athlete’s preparations as well as my own. Watching has made me keen to return and perform; I’ve never raced here as I’d like, it’s time to correct that. I’ll be entering when the event opens on Tuesday. I’m motivated to race again and to race well. Spring may have restored the desire to train, watching an Ironman has restored the desire to race. There’s still a lot I want to achieve as an athlete. With those who raced chilling out it’s hard to get myself moving today. Steven ensured we swam two laps this morning which I’m grateful for. I’ll aim for a run before dinner, it’s a shame to waste training time. The camp has been good and I’ll write about it on my flight home. I’ve race video to edit and a few fresh ideas for blog topics inspired from the build up and event.